Do you take care of yourself? In what ways? Do you need a break from busyness as the holidays approach? Is self-care difficult for you? 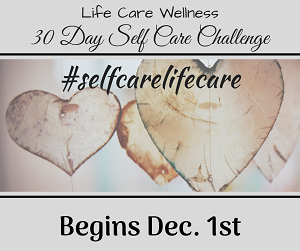 Take a little time for self-love in December by joining our 30 day self-care challenge! Beginning December 1, each day on Facebook and Twitter we’ll share a quick activity that works towards improving mental, emotional, and physical health. To participate, just comment or reply on our posts on those platforms as to how you’re completing the challenge, tag us (Facebook: /LifeCareWellness and Twitter: @_LifeCare), and use the hashtag #selfcarelifecare. So if you’re ready to join, go to our self-care challenge announcement posts right now and tell us why! Don’t forget to like our social media pages to stay updated on the challenge!